Are you searching for Muktinath tour by helicopter? Do you have limited time to visit Muktinath Temple? Wants to visit this sacred temple in just half day from Kathmandu or Pokhara? Looking for the best and cheapest fares to charter heli? Then, this Muktinath Tour Package is for you! Kathmandu to Muktinath by a chartered helicopter. Visit Muktinath Temple and back in just 5 hours from Kathmandu. Amazing view of the world's eight highest peak - Mount Manaslu (8,163m). Bird's eye view of Begnas Tal, Rupa Tal, Fewa Tal, and Pokhara Valley. Panoramic views of towering snow-capped Mountains like Annapurna, Fishtail, Dhaulagiri, Tukuche Peak, Nilgiri etc. A marvellous desert landscape of Mustang District. 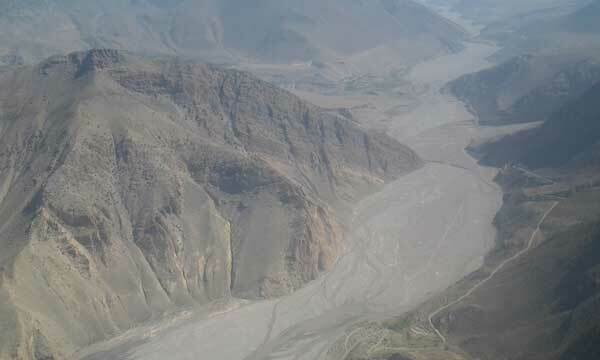 Views of Holy Gandaki River, Jomsom, Kagbeni, and Muktinath Village. 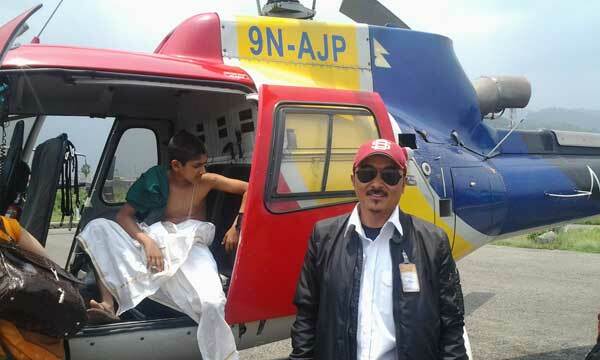 An adventurous horse ride from Helipad to Temple Gate. Holy bath under 108 chilled water springs and 2 holy Kunda. Why people visit Muktinath Temple? Where does the temple located and its travel access? Muktinath Temple is located at the laps of snowcapped mountains at Thorong-La pass at an altitude of 3710 meters above sea level in Mustang district of Nepal. Travel access is a little difficult due to its harsh weather condition. People can either fly from Kathmandu to Pokhara (25 minutes flight) then to Jomsom (15 minutes flight) and drive to the Temple (1:30 hours) or by roadway to Pokhara (7 hours by bus) to Jomsom (9 hours by jeep) then to the temple. Since, flight to Jomsom is operated in early morning only, one night stay at Pokhara is a must. Nowadays people can charter a helicopter and easily access this temple in just 1:30 hours. How much time is required by Helicopter? Muktinath Temple is in one and half hour flying distance from Kathmandu and forty-five minutes from Pokhara. After landing at Ranipauwa - the helipad at Muktinath, you will be provided one hour to have a darshan of Muktinath Dham. Temple is half hour hiking distance from the helipad. So, hiking might take a long time therefore, you can ride on a horse and perform pooja at the temple on time. Since it's the windy place spending a long time for pooja might affect the flying time. How many people are carried by Helicopter? There is five and six seated helicopter available for charter to visit Muktinath Temple. So, it might cost expensive for one or two people and cheaper fare for more people. What permits are required to visit this temple? 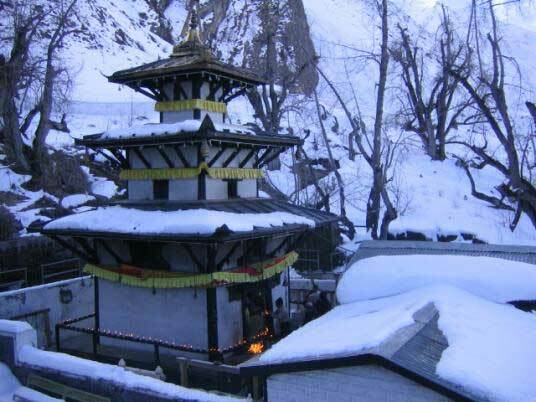 Muktinath temple lies in conservation and trekking zone. So, two permits are required to enter in this area. One is Annapurna Conservation Area Project Permit (ACAP) and another is Trekker's Information Management System Permit (TIMS). It is restricted to enter in this zone without collecting these two permits. Which are the best months? March, April, May, June, September, October and November are the best time to visit Muktinath Temple. During these months weather will be clear and snow-capped mountains can be observed closely from Helicopter. Can I visit Pokhara and stay there instead of returning back to Kathmandu? Yes, you can. After Muktinath Yatra, you can land at Pokhara and stay there. The helicopter will be returned to Kathmandu. You can come back to Kathmandu either by Tourist Bus, Private Car or scheduled flight. By road, it takes seven hours and 25 minutes by flight. 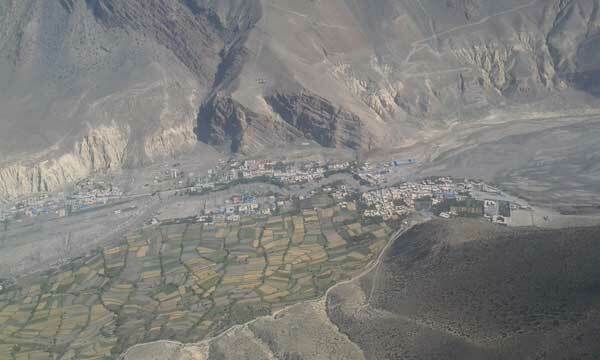 Day 02: Fly from Kathmandu to Muktinath by chartered helicopter, after worshipping fly back to Kathmandu. Day 02: Drive Kathmandu to Pokhara - 206km - 7 hours. Day 03: Fly from Pokhara to Muktinath by helicopter, perform ritual activities (worship, darshan, pooja) then fly back to Pokhara. Day 04: Half day Pokhara sightseeing and drive back to Kathmandu. Please contact us to know more about best time to visit Muktinath Temple, Kathmandu to Muktinath helicopter fare or Pokhara to Muktinath helicopter cost, Pokhara to Muktinath by air cost, Pokhara to Muktinath by helicopter fare, Pokhara to Muktinath helicopter, helicopter service in Nepal, Jomsom to Muktinath helicopter fare, Kathmandu to Muktinath by flight, Pokhara to Muktinath flight fare and more. Airport Pick up & Drop Transportation by private AC vehicle. Three star hotel in Kathmandu. Kathmandu – Jomsom - Kathmandu by Charter Helicopter. Expenses incurred due to mishaps, landslide, strikes, political unrest etc. in such case extra will be charged as per actual. Welcome to Himalayan kingdom of Nepal. You will be meet on airport and transferred to your hotel. After the arrival, we will be briefing about your trip. If you have any questions or doubts about your trip should be asked and clarified at this time. Then evening you will be visit to Pashupati Nath Temple for Aarati Darshan, than back to Hotel. Overnight. Early in the morning breakfast, transfer to domistic airport fly to Muktinath by Helicopter - 1 hour 15 minutes. Helicopter Lands at Ranipauwa, from there either walk ascending around 25 minutes or motor bike ride around 7 mins to reach at Temple. 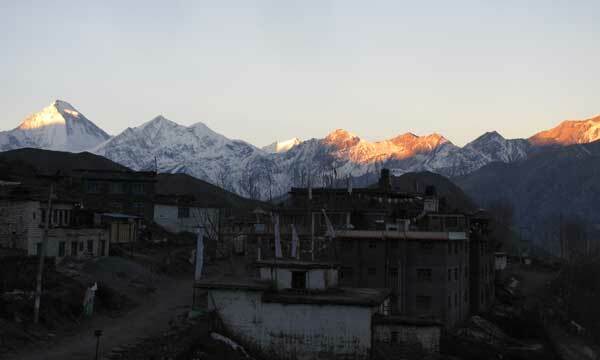 Muktinath is god of Salvation; it holds great significance for all spiritual people in the south Asian sub-continent. Muktinath (the provider of salvation) has been one such holy site, where thousands of devotees flock for attaining the much sought after moksha, have holy bath on 108 waterspouts, name of "Muktidhara". & Holy bath in Mukti Kunda (2 Kunda in front of Temple), Hindu devotees take bath under chilled water of 108 waterspouts "Muktidhara" & Mukti Kunda, its believing that it brings them salvation, Have Darshan and worship to Muktinath Temple come back to Ranipauwa where Helicopter is waiting for us then fly back to Kathmandu. Arrive and transfer to hotel,leisure or individual activities. Overnight at hotel. Pashupatinath Temple: Dedicated to Lord Shiva, this is Nepal's most sacred Hindu shrine and one of the subcontinent's great Shiva sites. The supreme holiness of the site stems from the Shiva linga enshrined in its main temple. It expresses the very essence of Hinduism as pilgrims, priests, devotes, temples, ashrams, images, inscriptions and cremation ghats intermingle with the rituals of daily life, all sprawled along the banks of the sacred Bagmati River. The temple's origins are obscure. An inscription here dates from 477 AD, but the shrine may have stood there for 1000 years before that. home to the Royal Kumari, the Living Goddess and a manifestation of the great goddess Durga. An intriguing piece here is the 17th century stone inscription set into the wall of the palace with writings in 15 languages. The Durbar square, protected as an UNESCO world Heritage site, is the social, religious and urban focal point of the city. There are also museums inside the palace building. There is an entrance fee of Rs.250 for foreign visitors. In Evening leisure, overnight stay at Hotel. After breakfast you will have some free time until the time to leave the international airport for final departure.